While being able to play a game cooperatively may not be new by any means, this gaming feature has definitely seen a growing presence over the last few years. Instead of fighting your friends to see who’s the top dog, many gamers are leaning towards working together and watching each other’s backs. 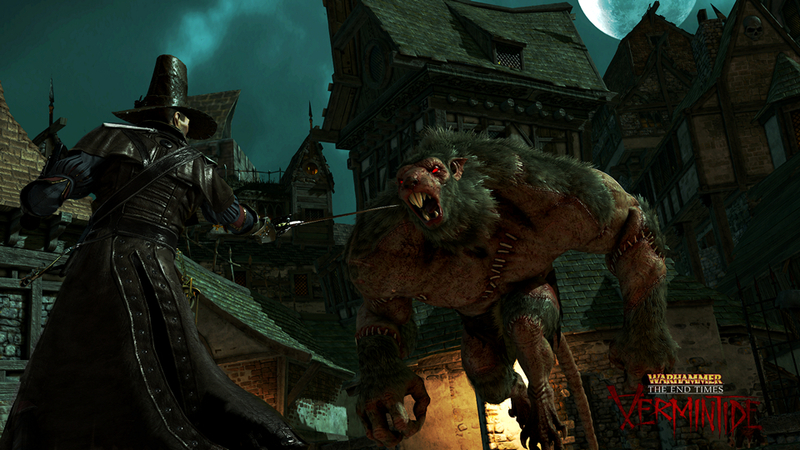 One of the latest games to take this concept to heart is the upcoming Warhammer: The End Times – Vermintide, which will be kicking off an apocalyptic styled story for the Warhammer fantasy franchise. Using a mixture of technology, magic and medieval styled weapons, four players work together to fight their way through a number of levels which are made up of procedurally generated enemy spawns, keeping things fresh each time you want to run through an area. Only four of the classes have been revealed: the Empire Soldier, A massive hammer wielding class that can also switch to a Gatling styled weapon that can do a shotgun blast or rapidly fire single shots, The Waywatcher, a Wood Elf that uses a bow and dual swords to decapitate foes, The Bright wizard, who uses fire magic but must balance using it for fear of igniting herself, and the Witch Hunter. Instead of giving each class a specific role that limits a classes ability to either attack from a distance or get up close, both the Empire Soldier and the Waywatcher who were playable in the pre-alpha build had the ability to mix things up in combat. Switching between weapons on the fly and never having to simply focus on one primary weapon, left me to cover my immediate area, while still giving support to my team from a distance. This worked incredibly well, as neither class felt limited in what they were able to bring to the fight, and each class was able to adjust accordingly to a battlefield that kept shifting between mob types and numbers. As the Scaven, a man-sized rat race that could sneak up on you from almost any direction would pop-up, and in multiple forms, the need to stay close become more of a natural construct of necessity than one forced upon the player. Having a giant rat grab you with a hook and drag you across the map, made me quickly learn to communicate, as well as stay near my teammates since they were my own hope to make it free. Visually, Vermintide was a solid looking game, and even in its early pre-alpha state, it was able to set an atmosphere and tone that worked well for what it looked like it was trying to do, let players move through a city crawling with enemies, but never make it feel overly repetitive. Sadly, only one location was available, so it is difficult to see how far or varied the locations will take you, but the city of Ubersreik looked great. Being a major fan of cooperative shooters, and the fact that the developers have said that they are planning on having a team that is dedicated to just developing updates for the game, Vermintide looks like it will be a title I will be keeping an eye out for it when it releases in Q2 of 2015.